Regardless of whether you own a commercial business or are a simple homeowner, electrical services are the need of the hour for everyone. Right from installing, testing, to maintaining electrical systems, there are several reasons why you may need an electrical professional. So, you must look for an experienced and reputed electrical repair company like ours, at the JPEG INC Electrical Contracting. We are a family owned and operated electrical service known for providing residential, industrial or commercial services for more than 15 years now. 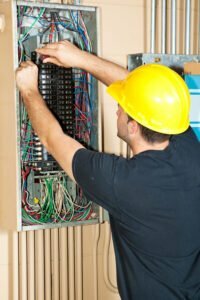 Therefore, no matter if you need help with your electric circuits, ceiling fans, lights, emergency generators, water heaters, at home or the data or communication line, computer circuits, code corrections, control wiring, fiber optic cabling, and so on for your office, you can resort to our electrician. Here, we have put together 3 ways in which an electrician can help in both commercial as well as residential areas. Take a look. First of all, you should be aware that you might need to install several new electrical devices or fixtures every now and then. So, you need an electrician at hand who can install a light, ceiling fan, exhaust fans, or anything else. Electrical systems are subject to failures too after a considerable time of usage. If suddenly there is an electrical failure in your office space, it will be a matter of inconvenience as well as affect the productivity of your business. Even for homeowners, it can be an immense amount of discomfort and trouble. You need an electrician to help. Lastly, you might also want to know how to maintain your electrical systems better. Such important suggestions on maintaining safety or making the most of your electrical systems can be better understood when you have a professional electrician to guide you. So, if you want to hire our electricians for this in areas like Fort Lauderdale, Hollywood FL, Miramar FL, Plantation FL, Southwest Ranches FL, or Weston FL, quickly call us at 954-410-3995 now.